It seems hard to believe that this is already the 23rd week of Weekend Cat Blogging (WCB), a fun event that has grown by leaps and bounds due mainly to my dear friend Clare's nonstop enthusiasm and love of cats. I remember when there were just three of us posting pictures of our cats each weekend. This special edition of Weekend Cat Blogging is dedicated to Clare, and we have invited everyone to join in, even if you are catless. Boo at Masak-Masak in Malaysia is this weekend's guest host. Click here to find all of the links to this week's outpouring of love for Clare and Kiri. More links will be added throughout the weekend, so be sure to check back on Monday for the complete roundup. If you would like to join us, simply leave your WCB#23 permalink in a comment at Masak-Masak. Special Additon! Click here to see Miss Domino, our lovely foster blog cat, looking for Clare & Kiri. As promised, I have come up with some hearts & cats for Clare & Kiri. Well, lots of hearts, but just one cat. Today is opening day of Deer Season, and everybody except Molly Doodlebug is out trying to bag themselves some venison. So here are the hearts. . . 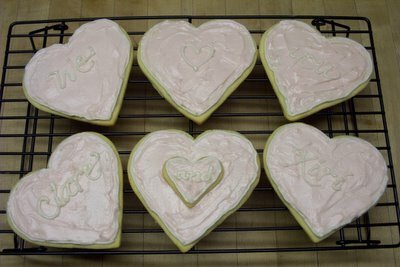 This was my first foray into cookie decorating and color scheming; you may need to click on the photo to read the writing. And here is the cat. Why on earth I thought she would sit nicely next to the plate of cookies while I snapped a darling picture is beyond me. And no, she's not just sniffing them. . . Many thanks to everyone who has taken the time to send e-hugs and healing thoughts to Clare during the past week. If we keep it up, hopefully she'll be back with us for Weekend Cat Blogging #24. That is very cute what you did with the cookies. And my cat would do the same thing as the doodlebug! Have a great weekend, very nice post for Claire. 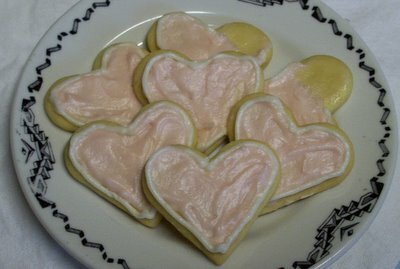 little miss molly doodlebug is so cute eating hearshaped cookies, oh brother. Love the pictures of the swing and field again! So pretty -- no matter the season! Great idea, Farmgirl! You done good, as we say in North Carolina. DB is such a cutie. Those cookies are so cute and perfect for Auntie Clare and Kiri. 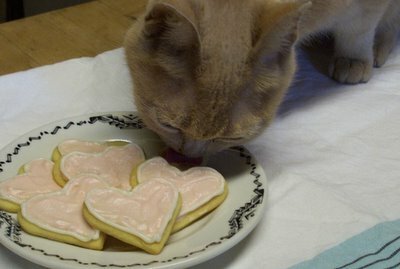 I bet my brother Kits will love them too as he likes sweet things. I couldn't believe how fast she went for that frosting. Come to think of it, it's been quite a while since The Doodle Monster knocked over my bedside glass of water. Not that she hasn't been doing other troublesome things of course. Yep, she's a cutie. That's why she gets away with so much. What is it with all these cookie-eating cats? I had no idea. Guess I've been lucky I haven't had to share mine with them--until now. P.S. Awesome job on the WCB roundup! there my doodle monster ! I hope Clare and Kiki are on the mend.